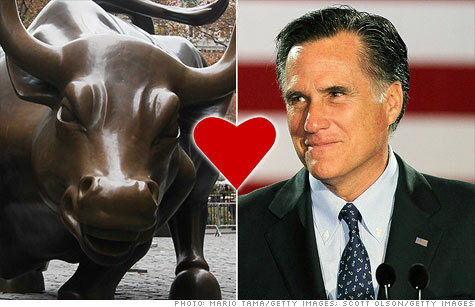 Love is in the air on Wall Street. NEW YORK (CNNMoney) -- Hell hath no fury like a woman scorned -- but what about a Wall Street titan? Individuals who work in the securities and investment industry have given the Romney campaign $8.5 million through the end of April, according to data from the Center for Responsive Politics. Over the same time period, Obama has brought in only $3 million from securities and investment workers, and the industry is only the campaign's fifth largest source of funds. "They have basically ditched Obama," said John Dunbar, the managing editor for politics at the Center for Public Integrity. "Romney is just a much friendlier candidate if you are a banker." The absence of Wall Street love is a departure from the norm for the Obama campaign. In 2008, then-Senator Obama raised almost $16 million from Wall Street. John McCain, the Republican nominee, received donations totaling only $9 million. The shift is evident even within specific firms. The employees of Goldman Sachs (GS, Fortune 500), who have traditionally given more money to Democratic candidates, have donated more to Romney's campaign than any other firm. Meanwhile, individuals associated with Goldman have given far less to Obama this cycle, even after he milked the bank for $1 million in 2008 -- or four times McCain's haul. Goldman isn't an isolated case. The top six spots on Romney's donor list are all financial firms, with Bank of America (BAC, Fortune 500), JPMorgan Chase (JPM, Fortune 500), Morgan Stanley (MS, Fortune 500), Credit Suisse (CS) and Citigroup (C, Fortune 500) following Goldman. Of the top 20 organizations and businesses with donors who contributed to the Obama campaign, not one is a bank or investment firm, according to Center for Responsive Politics data. The dwindling donations underscore intense feelings of dissatisfaction that some on Wall Street feel toward the White House, both in terms of the rhetoric used and the policies pursued by the president. "Wall Street has taken some of the blame for the financial crisis," said Viveca Novak of the Center for Responsive Politics. "The result of that has been increased oversight and regulation -- two things that are never popular." Early in his presidency, Obama chastised "fat cat" bankers who took large bonuses during the financial crisis. He then worked to pass a financial reform law that included restrictions on banks that some in the industry find onerous, especially the so-called Volcker Rule that would limit some types of trading activity. After a period when it looked like the relationship between big business and the White House was on the mend, new fissures appeared as the president embraced the rhetoric of income inequality. Obama discussed the growing wealth gap in a series of high-profile speeches, including his most recent State of the Union address. With the general election campaign now fully underway, Obama has been more specific in his attacks on Romney, and much emphasis has been put on the former governor's career at Bain Capital. The president's words and the campaign's advertisements have not cast private equity in a flattering light. Vice President Joe Biden said last week that a career in private equity "no more qualifies you to be president than being a plumber." Dunbar said the escalating rhetoric is a sign that the White House has "made a calculated decision" to "go to war" with Romney over Bain. "They've decided to burn the bridge and go after Wall Street. They have decided to rely on populism." The industry, by all accounts, is not enjoying its thrashing from the president. On the same day that the Obama launched its campaign against Mitt Romney and Bain Capital, the president attended a fundraiser at the Manhattan home of Tony James, the president of private equity firm Blackstone (BX). Fortune reported that the president didn't specifically mention private equity, and the attendees, who had paid $35,800 per plate, didn't ask. Two power players who are even closer to the White House, ex-auto czar Steven Rattner and Newark Mayor Cory Booker, have come to the industry's defense, complicating matters for the president. Asked last week about his campaign's attacks on Bain Capital, Obama walked a fine line, saying that there "are folks who do good work in that area" but "their priority is to maximize profits." Related: Could Europe sink Obama's campaign? "When you're president, as opposed to the head of a private equity firm, then your job is not simply to maximize profits," Obama said. "Your job is to figure out how everybody in the country has a fair shot." The breakdown of decorum between Wall Street and the White House sharply reduces the odds that Obama will be able to match Romney's fundraising totals from industry players. But given the substantial investments the White House has made in its so-called ground game, dwindling funds from Wall Street won't necessarily leave the campaign cash-strapped. Many observers still expect Obama to raise a cool $1 billion by November. Still, the attacks could push a wealthy donor to make a substantial contribution to a pro-Romney super PAC -- groups that can accept and spend unlimited money. One pro-Romney super PAC, Restore Our Future, has already raised more than $20 million from individuals and organizations associated with the securities and investment industry. Obama's super PAC, Priorities USA Action, has received only $218,500 from the same group.